Obedience training your own dog can be a slow, difficult and sometimes frustrating process if you do not have the knowledge, time, or patience. At A1K9 we are used to schooling dogs to a high level of obedience, to provide the foundations for the personal protection work that we specialise in. 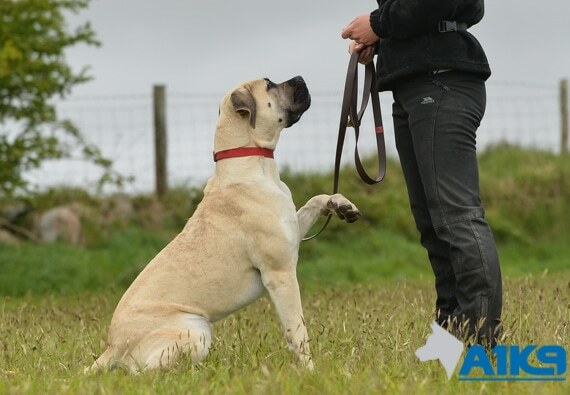 We utilise our extensive dog training knowledge to train customers' dogs sent to us for residential dog obedience training at A1K9, where we cater for all breeds of dogs, large and small. Both Charles and Gaynor, A1K9's two directors are full members of the British Institute of Professional Dog Trainers so your pet could not be in better hands. The duration of our residential dog training course is 4 to 5 weeks, during which time we teach your dog the following disciplines. All of the above is taught both on and off leash, using a combination of tried and tested reward based training techniques both old and new. We will not compromise on the high standards we set ourselves but more importantly, we encourage the dog to want to learn, making it a happy experience for the dog whilst it is with us and for the owner when it returns home. For the duration of the training your dog will stay in our purpose built facilities and be tutored by our team of expert dog trainers. Dogs of all breeds can be booked onto our residential obedience training programme; however, they must be over 10 months of age and be fully vaccinated. We achieve consistently high results much to the delight of our clients who entrust their much loved family companions to our care to learn new skills but don't take our word for it, please see our testimonials.